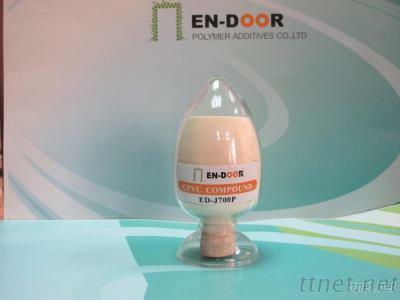 En-Door Polymer Industry Co., Ltd.
ED-J700P is chlorinated polyvinyl chloride compound used in a variety of industrial applications where a high functional temperature and resistance to corrosive chemicals are desirable. These cost-effective compounds combine high strength performance, high heat distortion temperature, chemical resistance, flame retardancy. Key performance properties are optimized through the selection of appropriate additives to meet certain regulatory and performance requirements. ED-J700P is developed for the extrusion of pipes for water supply. They are widely used to produce pipes for conveying systems of cold and hot water, super clean water, drinking water, sewage, water processing, air-conditioning water in residential usage such as office buildings, education, healthcare, hospitality, mass transit, villa, pool and SPA, etc. N. W. 25KG in plastic woven bag. Stored in the dry ventilated warehouse avoid light and rain. It is non-flammable and non-explosive. Handle and transport in accordance with general regulations.